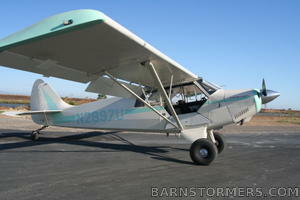 Husky 2897U was manufactured by Christen Aircraft in 1987 as their model A-1, and was designed to be a better Super Cub. While there is nothing better than a Super Cub, the Husky is a damned fine airplane, nevertheless. It has a 180 hp engine, flaps and vortex generators on the top of the wing. It has remarkable slow flight handling characteristics, and can land and take off in a couple of hundred feet. It is not a great airplane to train new tailwheel students because it has toe brakes (I hate training tailwheel students in an airplane that doesn’t have heel brakes) and most of the flight controls are located up front, making it hard for an instructor, sitting in the back, to take over in times of stress. But it is great fun to fly and can help an experienced tailwheel pilot develop new skills. Sadly, or not so sadly for the new owner, Husky 2897U has taken flight up north, to Oroville, California, where she will be loved and cared for by a very nice man. She will spend her nights in a hangar and will have a 2000 foot grass strip to play on. She was born for grass.